Want to know which recipe we actually make on the regular at our house? 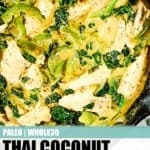 This Paleo, Whole30 + Keto Thai coconut curry is one we put on the meal plan quite often, and it never gets old. It’s dairy-free and made with gut healing bone broth, green or red curry, veggies and chicken. 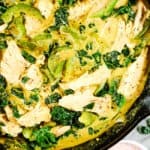 This Paleo curry is an easy comfort food recipe to love! Not only is curry super delicious, it is also hosts a slew of health benefits, most notably from the turmeric in it. This PBS post shares more about the history and health benefits of turmeric. 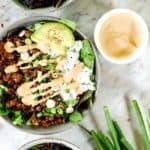 Full of antioxidants, anti-inflammatory and brain healthy goods, curry powder is probably an underutilized super spice in your cabinet if I had to guess. It’s really just a combination of spices – most often turmeric, coriander, cardamom, cumin, ginger, mustard seed, pepper and cinnamon. 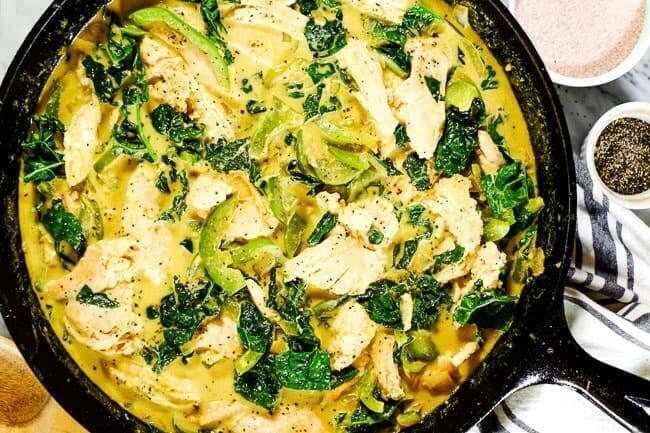 When you use a paste like we’ve done with this recipe you get some variation, but overall adding curry to your diet is a great way to get some superfoods into your day! 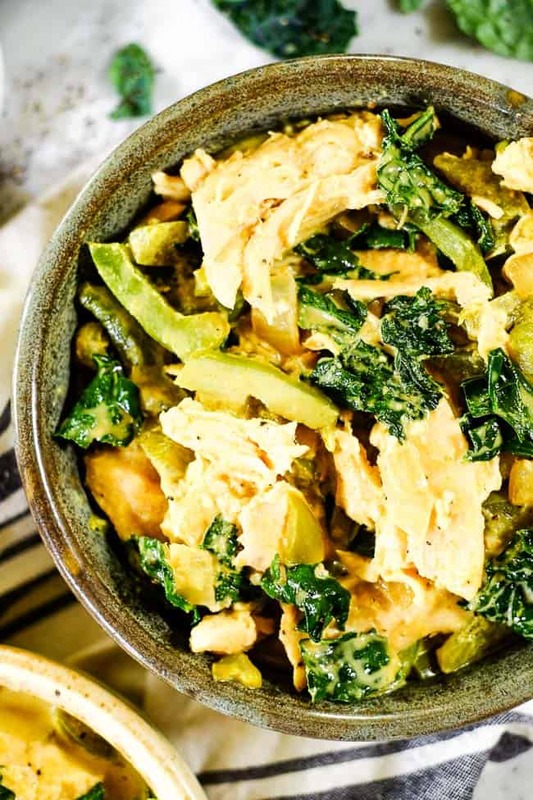 This Thai coconut curry recipe calls for either green or red curry paste. You really can choose either, and we note that finding a Whole30 compliant green curry paste is a little harder. This brand of green curry paste is cleaner than others which contain peanut oil. It does have Safflower Oil in it though which is considered an item to minimize if you’re doing a Whole30. 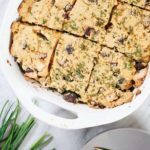 We think that using it in a recipe from time to time is ok, especially when it has turmeric and other health promoting ingredients! Here is the red curry paste we get when use that kind. 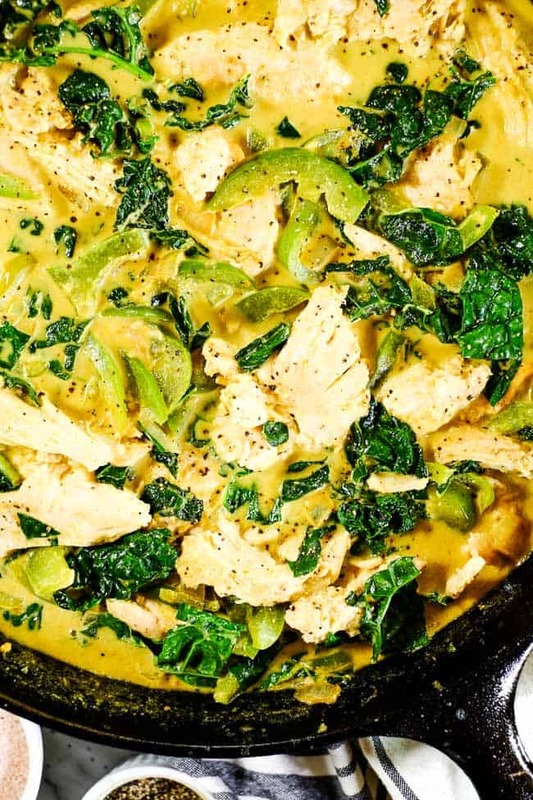 You can absolutely enjoy this Thai coconut curry just as it is. If you scoop some extra sauce into your bowl it feels a little soup like. 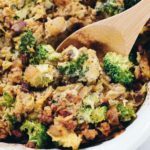 Some other ways to enjoy this are over rice (either cauliflower rice or plain white rice – stick to cauli rice for Whole30 – omit for Keto), with your favorite roasted veggies or in a roasted squash. 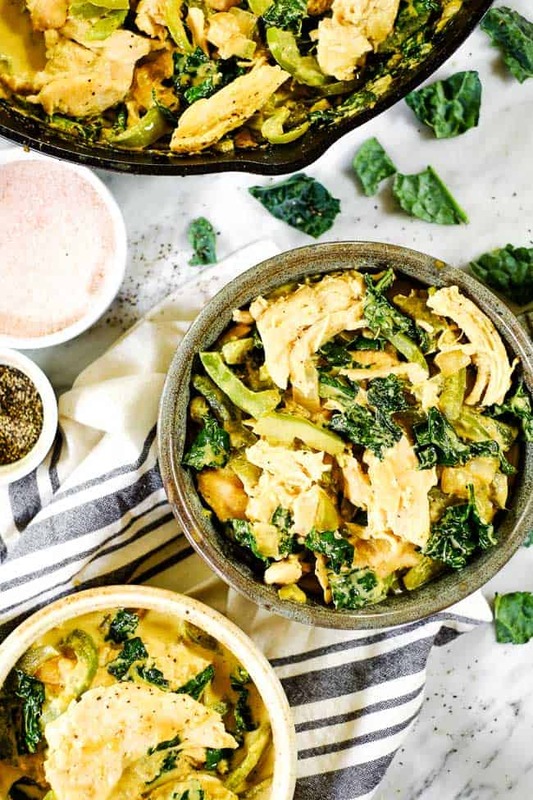 It’s tasty to stuff a delicata squash with this Thai coconut curry! You’ll have to let us know what you do with it. 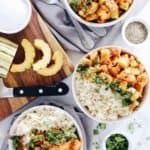 Whether you’re already a curry fan or you’re thinking it’s a good time to give it a try, plan to make this Thai coconut curry this upcoming week! 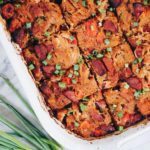 You’ll enjoy the leftovers for lunches or an easy dinner another night, and you might even become addicted like us. Leave a comment below and let us know how it goes. Also, take a pic to share on Instagram! Tag us @realsimplegood, and give us a follow if you don’t already! We’d love to stay connected! 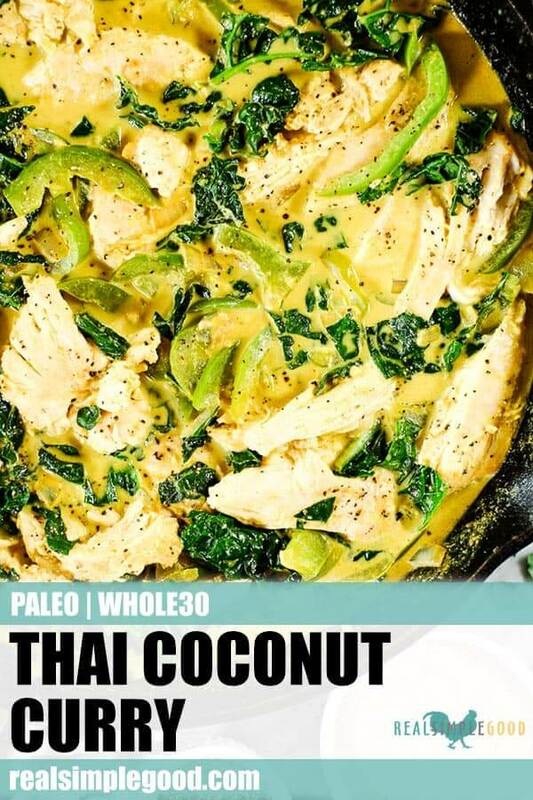 This Paleo, Whole30 + Keto Thai coconut curry is dairy-free, made with gut healthy bone broth, curry paste, veggies and chicken. 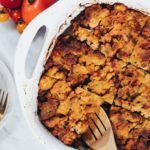 It's easy comfort food! Prep onion, garlic, ginger, bell peppers and kale as noted. Place the chicken breasts between two pieces of parchment paper and pound them down to make them even in thickness. Sprinkle each side of the chicken with salt and pepper. Heat a large skillet over medium heat and add avocado oil. Once hot, add the chicken to the pan (you may have to cook the chicken in 2 batches depending on the size of your pan). Cook, without disturbing for 3-4 minutes, until a nice brown crust has formed. Flip and cook another 3-4 minutes on the other side, until the chicken is mostly cooked through. Remove chicken from the skillet and set aside. Lower the heat to medium. Add more oil if needed and add the onion and bell peppers to the pan. Cook, stirring frequently, for 3-4 minutes, until they begin to soften. While the onions and peppers cook, break the chicken into smaller chunks using forks or tongs. Add the garlic and cook for 1-2 minutes, stirring constantly. Add the curry paste and stir for 1 minute to mix well. Add vinegar, chicken broth, coconut milk and ginger to the pan. Stir to mix, scraping up any browned bits remaining in the pan. Add the chicken breast chunks back to the skillet with the sauce. Cover and turn heat down to low. Simmer for 3-5 minutes, or until the chicken is fully cooked. 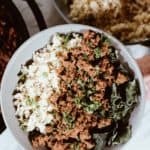 While the chicken is simmering, prepare the cauliflower rice. Heat a large skillet over medium heat and add avocado oil. Once hot, add cauliflower rice and simmer, stirring frequently, for 4-5 minutes or until tender. Season with salt and pepper to taste. Add in the kale with the chicken just before serving and cook for another 1-2 minutes, until wilted. Serve chicken over cauliflower rice and spoon some sauce over everything for serving. 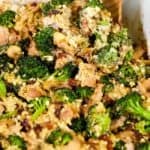 Nutrition facts are an estimate provided for those following a Ketogenic or low-carb diet and do not include cauliflower rice for this recipe. See our full nutrition information disclosure here. 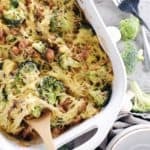 Would this be good using cashew milk instead of coconut milk, as neither one of us like the flavor of coconut?